Your natural CoQ10 levels diminish over time due to poor diet, aging and certain cholesterol-lowering prescription drugs. 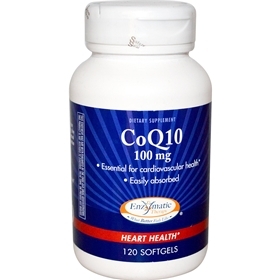 Heart health - CoQ10 fuels your heart's energy production. Energy support - As you age, your body produces energy less efficiently and needs CoQ10 to help. Brain function - CoQ10 ensures sharp brain function as you age. Coenzyme Q10 is beneficial for heart health in many ways. It assists in maintaining the normal oxidative state of LDL cholesterol, helps assure circulatory health, and supports optimal functioning of the heart muscle. CoQ10 may also help support the health of vessel walls. CoQ10 is a vital participant in the chain of metabolic chemical reactions that generate energy within cells. It is found in every cell of the body (the name ubiquinone stems from its ubiquity), but is present in higher concentrations in organs with higher energy requirements such as the kidneys, liver, and heart. Directions: One softgel daily. For additional support, take up to three softgels daily. Other Ingredients: soybean oil, gelatin, glycerin, beeswax, and soy lecithin. Also proven to improve circulation, support skin and periodontal health and promote healthy aging. Supplemental CoQ10 can help restore the natural CoQ10 depleted by cholesterol lowering medications and is proven safe to take alongside your prescription cholesterol-lowering medication. It provides your heart with the antioxidant power it needs for optimal function.